I'm hoping to enjoy my last Sunday before the craziness begins, but unfortunately I woke up not feeling my best. Going to try to power through it! I WANT to start my Emergency Sub Binder, because that's one of those things I always wait until the last minute to do and then I'm not happy with it. I also want to start working on my next grammar unit for TpT. I'm going to try to carve out a little bit of time every day for reading. I've been a voracious reader since I was a kid, but reading for pleasure is one of those things that goes out the window. At the very least, I need to keep up with my Goodreads challenge! I have my Kindle loaded with some not-too-challenging books that I'm hoping will take my mind off any stresses from the day. Thanks for reading! 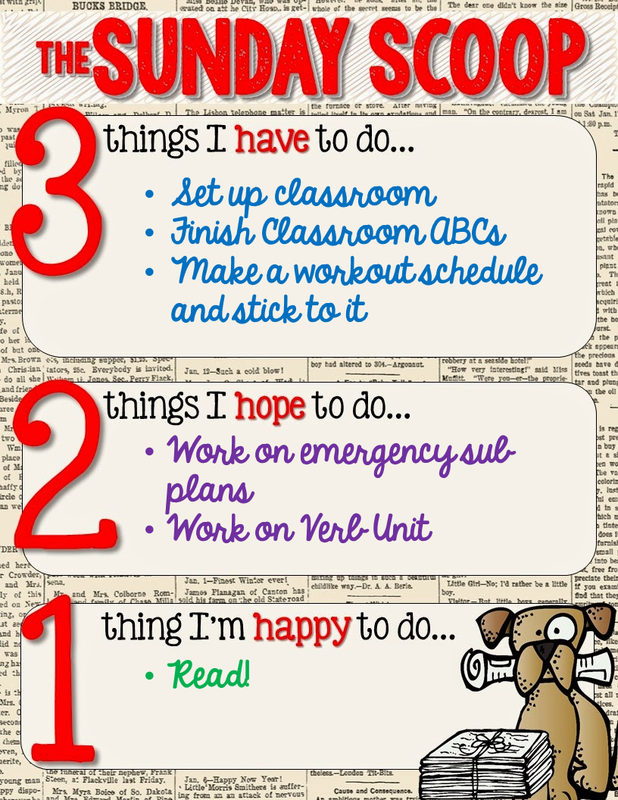 Share your Sunday Scoop over at The Teaching Trio! Trying again. Sorry. Emergency sub plans... such fun. We are required to have three days of emergency plans. Good luck with the workout, I'm right there with you. We need 3 days, too...I always put it off until the last possible second! Yeah!! It's very exciting that you have a blank canvas to work with...did you pick a theme for your new classroom? I hope we get to see your classroom reveal soon! Thanks for stopping by my blog today! :) What books are you reading?? I am always looking for a good book! I just started Stephen King's Revival. Seems interesting so far! Running on Empty by LB Simmons is another one I recently read that is probably the complete opposite...it was a light chick-lit kinda read. I don't have a bloglovin yet, is it something I should do? STICKING TO THE WORKOUT SCHEDULE! That's what I need! LOL have soooo much fun setting up your classroom, and please share pics when you get it all ready! Sticking to a workout schedule is also something that I need to do!! One of my hopes is to get back into the gym, so that's first! lol, but I'd like to get a schedule and stick with it too!